Clif Bar & Company today launched the Clif Ag Fund, a new investment fund to help increase the economic resilience of organic farmers in its supply chain. The fund’s initial investment will help finance a $10 million program that could provide up to 80 organic farms with long-term energy cost savings from hosting on-farm wind turbines. The Clif Ag Fund’s wind energy program is a partnership of Clif Bar, two of its major ingredient suppliers and United Wind. Clif Bar and its suppliers, Grain Millers and PURIS™, bring the project a large network of organic oat and pea farmers, many facing high and steadily rising energy costs from their use of non-renewable energy sources such as coal and natural gas. United Wind brings its expertise as a leading one-stop shop for leasing small wind turbines. In addition to the value of its supplier and farmer networks, Clif Bar is providing initial seed funding of $500,000 to the wind energy program, with other large investors slated to invest the remaining $9.5 million. 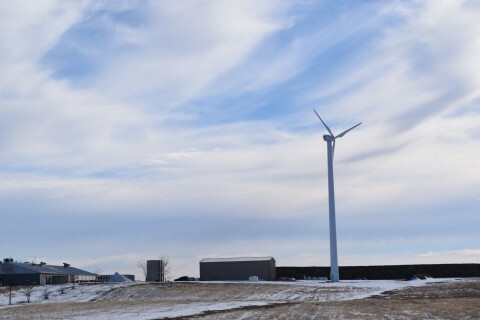 Farmers in the wind energy program will lease a small wind turbine from United Wind that will provide them with their electricity needs at a fixed monthly rate for 20 to 30 years. They won’t have to pay upfront fees or maintenance costs for the turbines. The new program will focus on farms in windy Midwestern states such as Iowa, Minnesota, North Dakota and South Dakota. “We're excited to pioneer this wind initiative alongside Clif Bar & Company,” said Russell Tencer, CEO of United Wind. “It enables their farmers to access clean, low-cost, distributed wind energy and builds on Clif’s leadership in sustainability." Clif Bar’s new Ag Fund builds on the company’s ongoing commitment to organic farmers and their communities. Since becoming the first major energy bar maker to use organic ingredients in 2003, Clif Bar has purchased more than 1 billion pounds of organic crops. In addition, Clif Bar has become the nation’s largest private funder of organic research, funding 17 graduate fellowships in organic plant breeding and committing to raise $10 million to fund endowed chairs in organic plant breeding at leading U.S. public universities. Two endowed chairs already have been funded. The Ag Fund’s use of wind energy in its initial investment extends Clif Bar’s longtime leadership in addressing climate change through innovative business strategies. United Wind is the leading national developer of distributed wind energy projects through its industry pioneering WindLease program. Founded on the belief that the wind energy must be affordable to compete with conventional energy sources, United Wind provides customers with wind energy options that make sense today and into the future. For more information, visit www.unitedwind.com.